Encompassing many different countries in east Africa, and at a length of about 2000 miles, you have probably not heard of this spectacular land formation. I will not tell you the name, but I will give you clues in this paragraph, as I have given you two already. Ready… Go! Three lakes lie in it, Lake Victoria, Lake Tanganyika and Lake Malawi. One of the tallest mountains in the world lies on its' edge, Mt. Kilimanjaro. The worlds' longest river has its source in its area, the Nile River. Most of the Serengeti Plain lies within it. But perhaps the most important, concerning and amazing thing about it, is that it will cut the entire continent in two someday. Have you guessed it by now? If you have, good job, if you have not, it is the Great Rift Valley. The valley does run through a great many countries, from Eritrea in the north, to Mozambique in the south, crossing ten other countries in between. The center of the valley covered with fertile plains, bordered by huge mountains and steep cliffs. I know that you have knowledge of the Serengeti Plain, and that most animals of Africa live there. 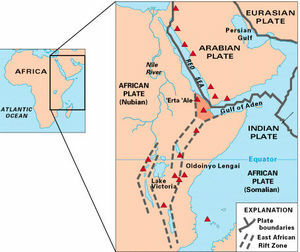 Now as I said before, the Great Rift Valley will some day spilt Africa in half. The reason for that is because two of the Earth's plates are pulling apart from each other, or they're 'rifting,' creating a lowland or valley in between. At their current speed today, the plates should fully come apart in about 125 million years from now.